Male House Sparrow, by John Harding. Garden Wildlife Health (GWH) is a collaborative project between the British Trust for Ornithology (BTO), the Zoological Society of London (ZSL), the Royal Society for the Protection of Birds (RSPB) and Froglife which aims to monitor the health of, and identify disease threats to, British wildlife. 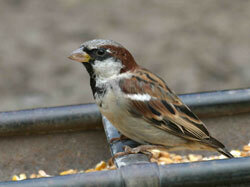 Our particular focus is on garden birds, amphibians, reptiles and hedgehogs. For this we count on the help of the public to submit reports of sick or dead wildlife and to send in samples for analysis. How does Garden BirdWatch fit in? BTO Garden BirdWatch participants provide additional systematic information through their weekly observations of garden wildlife and of sick and diseased wildlife entered through the new HEALTH TAB added to GBW Online. The information entered through the health tab provides the backbone for the new project. If you report dead or diseased wildlife through the health tab, please also go on to submit additional information (including photographs if you wish) through the Garden Wildlife Health system. We also need to know if you looked out for signs of disease but didn't see any. The Garden Wildlife Health system also provides an opportunity for suitable carcasses to be requested by the project vets, providing you with additional information on how the bird or animal died. The two components (Garden BirdWatch and Garden Wildlife Health) bring together systematic weekly observation with more opportunistic reporting of individual disease incidents. Why are wildlife diseases of interest? Wildlife diseases can cause population declines and even local species extinctions. They are a welfare concern (especially if they are caused, or exacerbated, by human activities) and some wildlife diseases can impact public health. It is important, therefore, that we monitor trends in wildlife diseases to identify their impact, underlying causes and to identify new and emerging threats (e.g. finch trichomonosis). Every report submitted by the public contributes to a national database of wildlife disease incidents. Every sample submitted is examined and then archived into one of the largest wildlife tissue banks in the world. These are invaluable resources that provide a solid grounding to study and safeguard the health of British wildlife. We also create reports that inform government and NGO policies on conservation management and we liaise with the relevant agencies when a possible domestic animal or human health threat from wildlife is identified. More information on the project, including information on wildlife diseases and best practice advice, can be found on the project website (www.gardenwildlifehealth.org). Garden Wildlife Health (GWH) is is funded by the Esmée Fairbairn Foundation, the Department for Environment, Food and Rural Affairs (DEFRA) and the project Partners.